While I waffled back and forth on what list I was going to take, in the end I decided on basically taking the same Deathriders based list I took to the Michigan GT with some small tweaks. 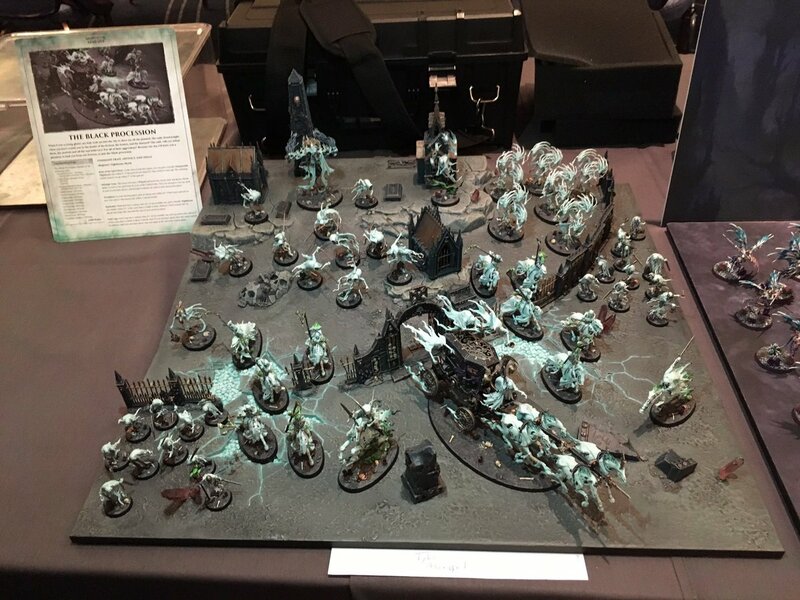 I had all of the models painted for it that I would need, plus I had some experience playing it, which never hurts. The only additions I made was swapping out the Chainghasts for a Lord Executioner and changing the Knight's spell from Spectral Tether to Soul Cage to deal with any potential first strike shenanigans. 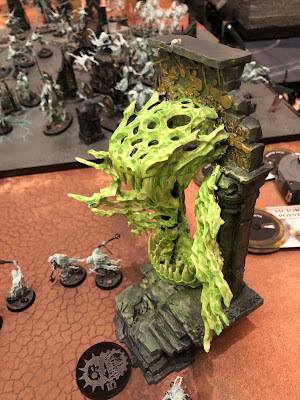 I also painted up the 500th store Bladegheist to have a cool model in the unit, and painted the other version of the Spirit Torment just for fun and to freshen up the army a bit. Without further adieu, lets get to the games! 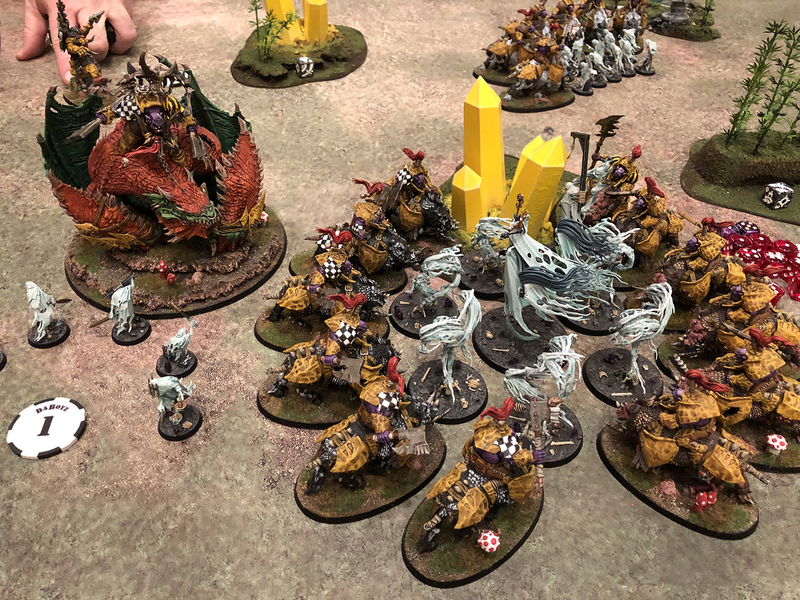 I knew the Ironjawz were going to be really fast and that I wasn't going to get the first turn, so I decided to deploy half my army off the board. What I did put on the board I kept off to the right corner, using one unit of Chainrasps to hold an objective, and the other as a screen to protect Olynder from any turn one charges. The Dreadblade went in the farthest corner I could put him in since he can teleport anywhere he wants anyway. Taking the first turn, Eric moved all of his army up pretty far, getting several chances to move them between the hero and movement phase. 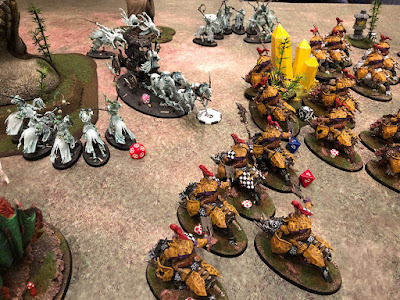 One of the units of Gore Gruntas and the Mawcrusha both ended up close enough for the charge, but he couldn't really maximize his attacks against the Spirit Hosts and Olynder, so he want for the unit holding the objective instead so he could at least score some points. Unsurprisingly, the Chainrasps didn't survive. 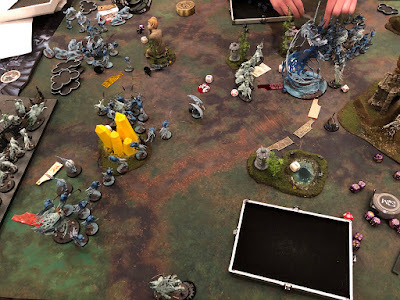 In my turn I used a spell from Ulgu to teleport the Lore Executioner to the other side of the board, then teleported the Dreadblade over there, using both of my command points to bring Olynder and the Spirit Hosts with him. 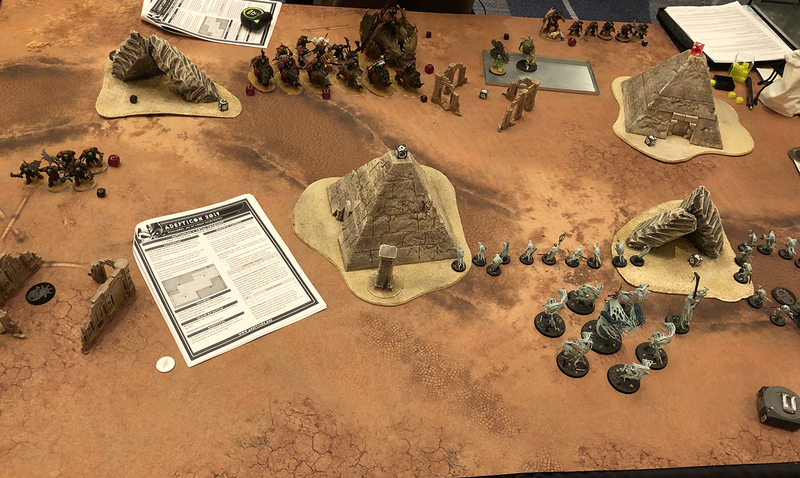 Then in my movement phase I brought in the rest of my army all along the left board edge, ready to take the two objectives that he was currently holding over there with Brutes. 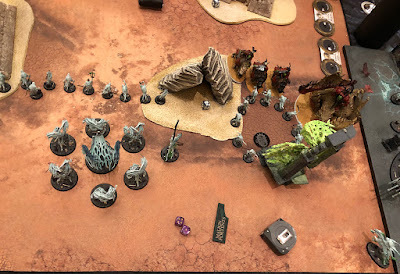 On my right hand side I moved the surviving unit of Chainrasps to be within 6" of the objective I had just lost, but as far away from his two units as I could so I could claim it since I outnumbered him. In the charge phase I managed to get the Spirit Hosts and Lord Executioner into the unit of Brutes closest to my side, and a unit of Hexwraiths into the other unit, all three of them rolling a 10+ on the charge, meaning they got to fight right away, and then again as normal in the combat phase. The unit of Brutes closest to me was wiped out in the combat phase, while the one on his side fared a bit better, but I still managed to kill enough of them and keep enough of my Hexwraiths alive to claim that objective, meaning I had three at the end of my turn. When it came time to roll for priority I won and took the double turn. I started moving my army to prepare to charge along his side of the board and wipe the orruks off the easier objectives before dealing with the Mawcrusha later. 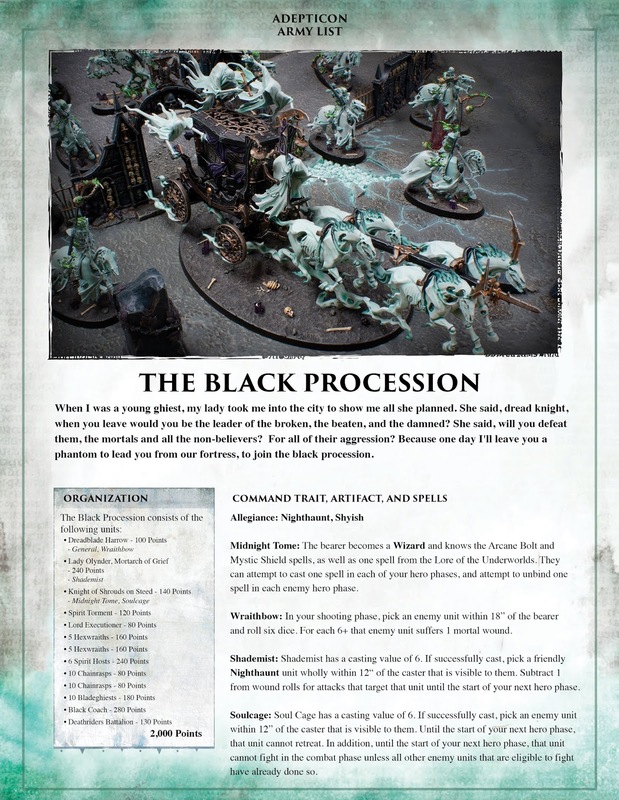 The Black Coach made a 10+ charge and between the charge phase and the combat phase was able to wipe out the other unit of Gore Gruntas, and the second unit of Hexwraiths charged in, helping finish off the unit of Brutes from the first turn. After my turn was done, my opponent decided there was no way he could win and conceded the game to me. Also, check out this awesome converted realmgate he had for his Bloodtoofs battalion! After playing Ironjawz round one, I was pretty confident I knew how to handle them. My plan was going to be similar to what I did in the first game, and I more or less deployed the same way and kept the same units off the board. I knew he was going to be fast, but I wasn't prepared for how fast and hard hitting a Gorefist with Gordrakk was going to be. All of the Gore Gruntas and Gordrakk himself made their turn one charges. I was prepared for the Chainrasps to die, as well as most or all of my Spirit Hosts with the intention of then teleporting the Dreadblade to the other side of the table and taking Olynder with him. 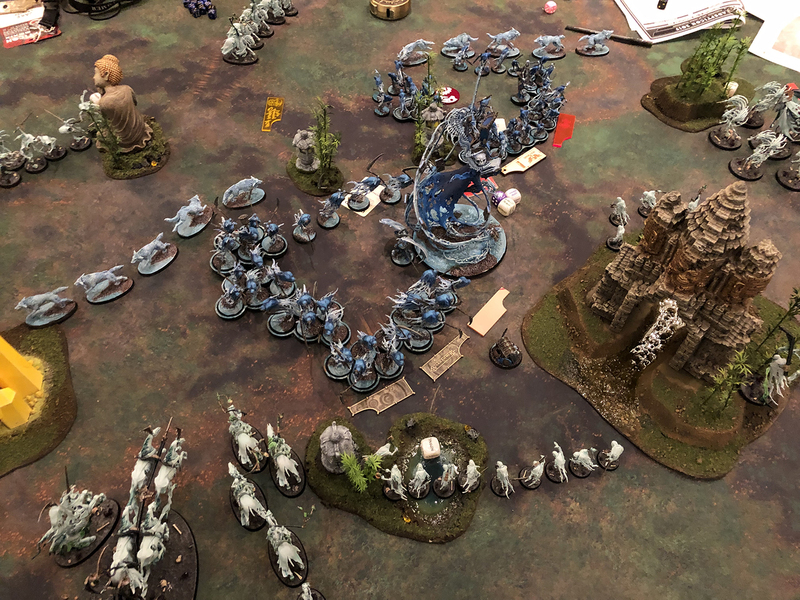 Unfortunately, the first unit of six Gore Gruntas that attacked the Spirit Hosts managed to kill three of them, opening up the space for one of the Gore Gruntas to pile in and attack Olynder. Apparently when you're super buffed by Gordrakk and re-rolling everything thanks to him and an Orruk banner, one is enough to kill a Mortarch. The rest of the Spirit Hosts died as well, leaving me only with a wounded Lord Executioner and the Dreadblade. On my turn one I teleported the Dreadblade to the other corner, and brought in all of my other units. I didn't make many of the charges though and was only able to take out one of his Warchanters. I did end up claiming an objective though. I ended up getting the double turn, and was prepared to start chewing back through his army. 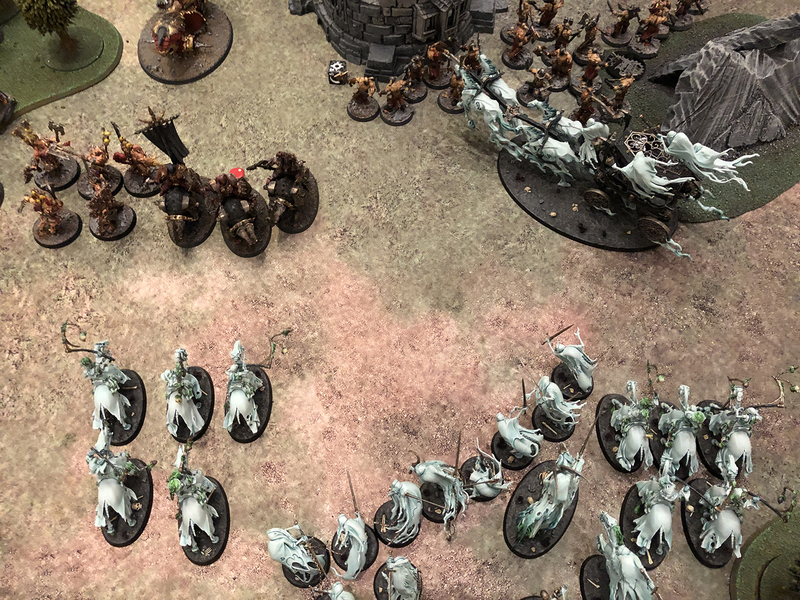 The Black Coach made short work of the Orruk Boss with a banner, while the Hexwraiths took out the other two Warchanters. 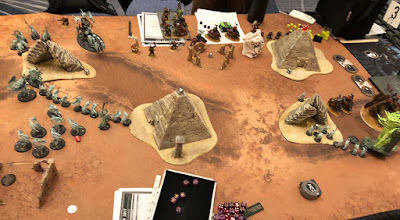 I charged the Bladegheists into the unit of Gore Gruntas closest too me (I was now essentially playing from his side of the table). I didn't get to attack in the charge phase though, which hurt me a lot, since he then used the Hysh command ability to have them attack first, and they of course wiped out the Bladegheists to a ghost. They were going to be fully buffed by the Spirit Torment and Knight as well. In his turn his army counter charged and killed a lot. We kept playing into turn three, but in the end he tabled me, killing every unit in my army. Gordrakk is not one to mess with. I wasn't even able to get any of my secondaries, but I did manage to score one point for a tertiary objective. This battleplan presented an interesting challenge for me, since I couldn't leave any of my units off the board. I deployed so I had a unit of Chainrasps holding each objective, but focused most of my army on my right side. I find my army works better if I concentrate it in one area and then just kind of sweep across the board since I have the mobility. This is a similar tactic that I used a lot with my chariot heavy Tomb Kings. He took the first turn and moved up a selection of his units, but wasn't able to charge anything. On my turn I managed to power up my Black Coach enough that it could run and charge, which it promptly did. I knew the large blobs of Reavers were going to be hard to budge with the Bloodsecrator making them immune to battleshock so I had to start grinding through them early. I also charged into his unit of Skullcrushers with some of my Hexwraiths, getting to attack on the charge. They did a bit of damage and suffered only one casualty in return. I luckily got the double turn, and the Bladegheists managed to wipe out the Skullreapers before they got to attack while the Spirit Hosts killed his Mighty Lord of Khorne on the charge. The Skullcrushers were also wiped out, either this turn, or turn three with the Hexwraiths. On his turn he counter charged me, with the Wrathmongers charging Olynder and the Executioner. He tried to have the Executioner hurt Olynder after a few of the Wrathmongers died, but he was unsuccessful. The Black Coach continued to grind through the Reavers, eventually killing them. In my turn three I teleported the Dreadblade behind the Bloodsecrator and brought Olynder and the Executioner with him as extra insurance. My secondary objectives were to kill his most expensive hero, which was the Bloodsecrator, and to wipe out a unit through battleshock, which I wasn't going to be able to do until he was dead. I managed to get the Executioner into combat on a 10+ charge and he killed the Bloodsecrator on the charge. His Blood Warriors advanced up my left flank and eventually took that objective from me, but I managed to claim both of his objectives by the end of the game. 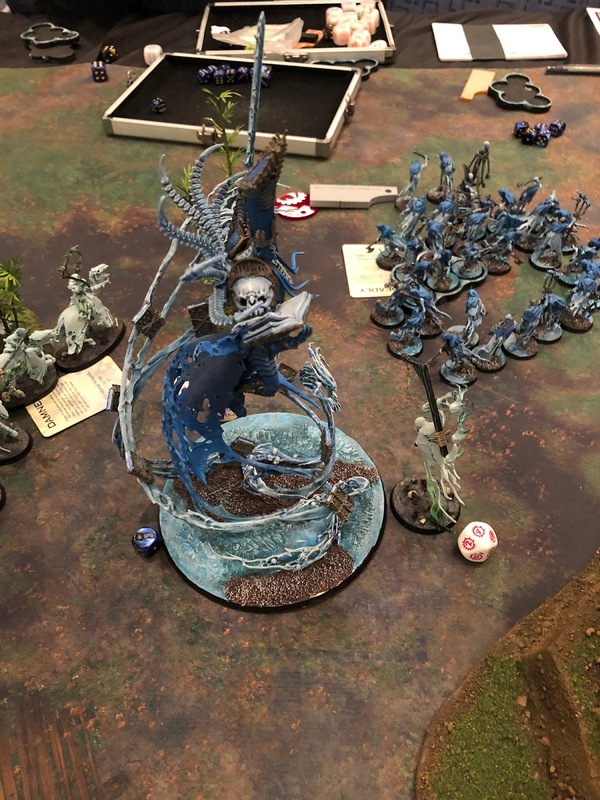 He did summon on a Bloodthirster and took one of them back from me briefly, but after it controlled it and advanced into my army I teleported the Dreadblade over to the objective to take it back. It was a very bloody game, as Khorne would like it. Having had good luck against Khorne last game by deploying everything on the board I decided to do the same this time as well. Plus, he deployed his Reavers in a way that would make it very hard to bring anything in on his side. He took the first turn and advanced everything besides the Reavers. 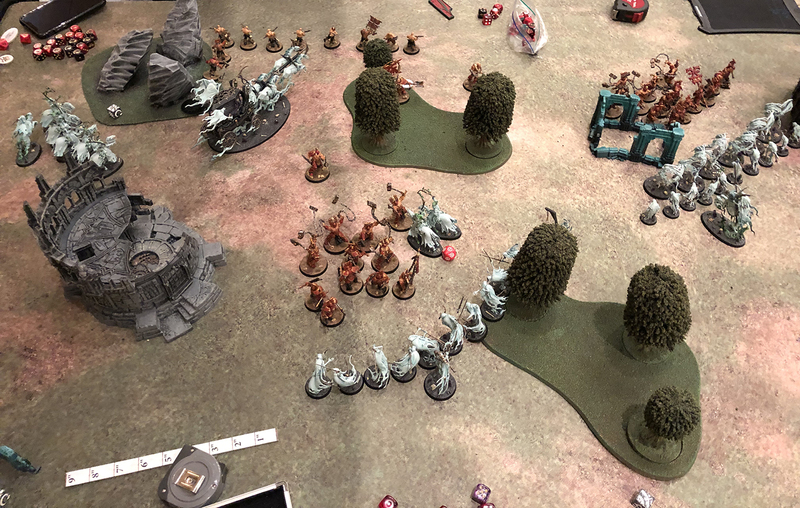 His Bloodthirster and Demon Prince managed to make the charge as well, with the Demon Prince making it to just behind my Spirit Hosts, and the Bloodthirster into my Lord Executioner and Hexwraiths. 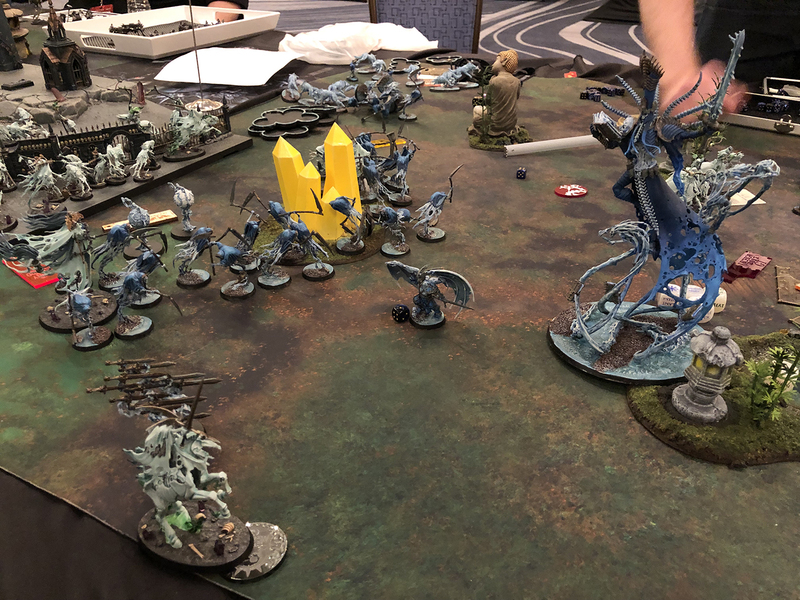 The Demon Prince had a 2" reach weapon, and I hadn't made the bubble around Olynder large enough with the Spirit Hosts, so he was able to attack her and killed her in one round with the Sword of Judgement. This wasn't the greatest start, but one of my secondary objectives was to have her killed by an enemy hero, so at least that was taken care of. The Bloodthirster tried to kill the Lord Executioner, but failed. In my turn I counter charged the Bloodthrister with the Bladegheists, fully buffed, and managed to kill it. 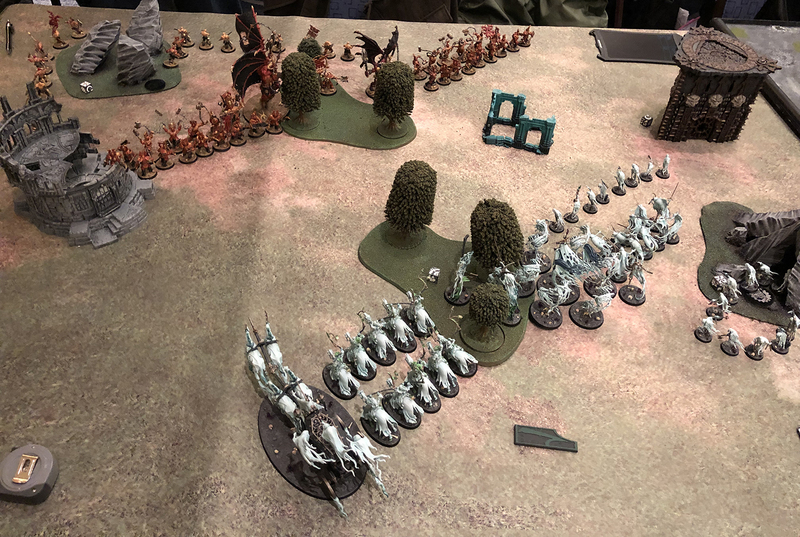 My Hexwraiths charged into his advancing Blood Warriors on my left side, while my Spirit Hosts started booking it for the right flank, hoping to intervene in time to hold up those units. 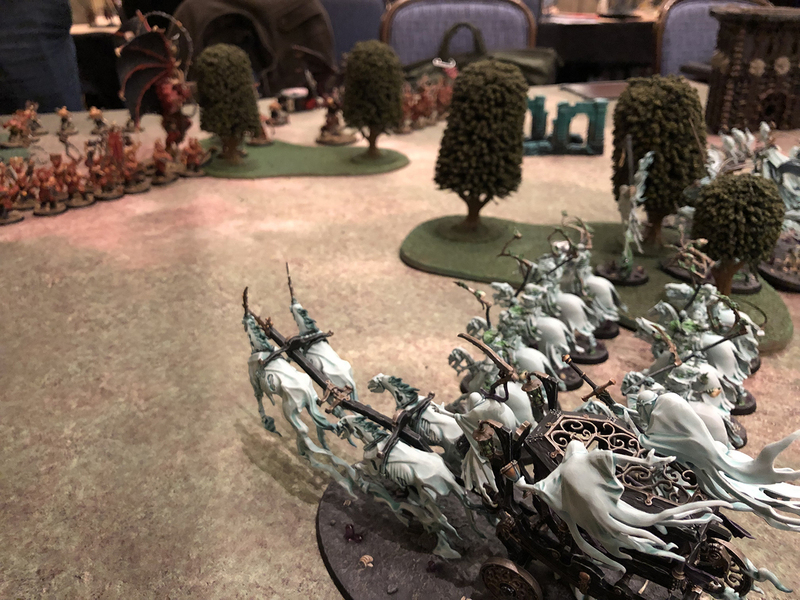 The Black Coach powered up enough to run and charge and managed to go around his entire army to charge into the Reavers in the back and kill one of the units. I ended up getting the double, and used the Dreadblade to teleport himself and a unit of Hexwraits back near his objective since the area was cleared out a bit. The Bladegheists and Spirit Hosts charged into the units in the middle, and started chewing through them, with the Spirit Hosts getting to attack in the charge phase, taking the Blood Warriors down to half strength. The Black Coach then charged the other unit of Reavers and killed all but one of them meaning I had both objectives. In his turn he tried to push through my units, but couldn't budge them and when it went to turn three I won since I controlled both the objectives. I wasn't able to get my other secondary, which was to get a hero off his board edge, which I had planned to do with the Dreadblade in turn three. I was back up near the top table now, table 19 I believe, which meant facing one of my club mates, Jake. Brad, Jake, and Shaun are the three members of the Detroit Warhammer Club that almost always finish high or win at events, so I knew it was going to be a tough game. I don't know if I've ever beaten Jake actually? His army was Nagash, 30 Grimghasts, 40 Chainrasps, and Dire Wolves and support characters. Double gulp with those Grimghasts. I ended up using a similar deployment to my first two games and kept half my army off the board. 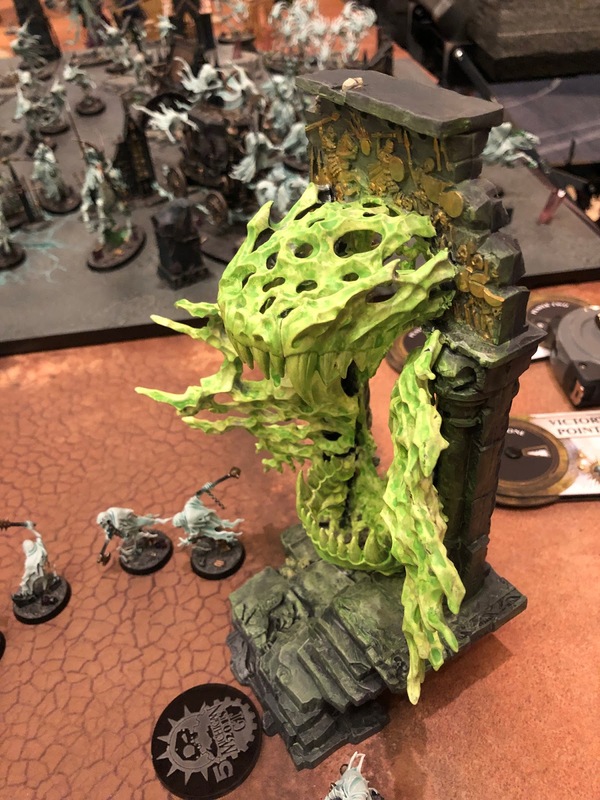 He got first turn and advanced up while planting Nagash right on the objective, while also super buffing himself with Nagash. At least there was no Hand of Dust attempt. On my turn I shuffled some units around to block some paths for him, and brought the rest of my army on to surround him. I was just hoping to take out the chaff units of Wolves early, so he either had to leave them dead or waste a command point on bringing them back. I was also trying to set myself up for the objective bouncing into any of the areas. Luckily before turn two the objective bounced into my left corner, where he had no units, and I won the priority. I teleported the Dreadblade and Olynder over there, put them and the Knight within 6" of the objective and as far away from him as I could, then strung some Hexwraiths out between them and the Grimghasts. Each of the heroes near it either had an artifact or were a wizard, meaning they counted as 20 models for holding the objective. I then charged the Black Coach into the Reapers, hoping to tie them up since it's a little tanky and they don't get re-rolls against it. I also charged every other unit in his army, including Nagash, meaning he would either need to kill them, or retreat to get over to the orb. Unfortunately the Black Coach was killed when the Reapers got to pile in a second time. They still had a bit to chew through though, so even though they killed my Hexwraiths, and most of my Bladegheists, I was able to hold onto the objective during his turn. 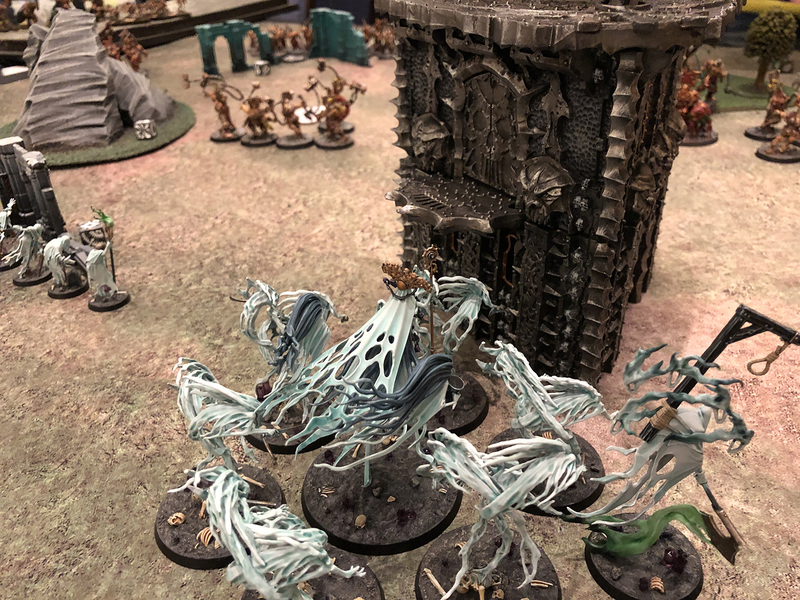 The Chainrasps attacking Nagash were wiped out, and the Spirit Hosts were being slowly whittled down, but they were all speed bumps anyway. In turn three the objective bounced onto my table edge. I ran the Knight over onto it, and then charged Olynder into as few of the Grimghasts as she could to tie them up. The Lord Executioner also charged into Nagash to try and tie him up. It didn't really work, but it was my only choice. By the time it was Jake's turn three all that was left of my army was Olynder and the Knight. He had been too far away to Hand of Dust him in his hero phase, so he advanced Nagash and the Vampire towards him, both needed 10" charges. The Knight got hurt a bit by Nagash's shooting attack, but the Lord of Undeath failed his charge! Then the Vampire failed too, but he spent a command point to re-roll it and he made it in. In the combat phase Olynder died, but the Knight held on. At the start of turn four the orb relocated to right next to Nagash, so we called it. There was no way I was going to take it back from him, and with the Knight being the only one left alive I was definitely going to get tabled. I ended up going 3-2 with my Nighthaunt, which is what I was hoping for. I placed 55th out of 186 people, so it's not that bad. I had hoped to be in the top 50, but I was pretty close. Looking back on my games I was happy with my list. I had considered taking Cogs instead of the Executioner, but neither of the games I lost was due to failing charges, so I don't think it would have made a difference, and the Executioner actually did some stuff during the games. I think I could have deployed further back in game two, but he may still have been able to reach me. Maybe if I had deployed at least one of the units of Hexwraiths on the board to act as a screen I could have held him up a bit, or saved a command point to pop my own command ability from Hysh to counter his and let the Bladegheists go, but in the end I just don't think I had the tools to deal with it. It was too strong of an alpha strike list for me to bounce back from. In my final game I'm also unsure of what I could have done. I didn't know where the orb was going to move to, so I had to spread my forces out a bit. If the Black Coach had managed to survive I think it would have gone a lot better for me. In the end it was a ton of fun, and I definitely know how to run this list effectively. 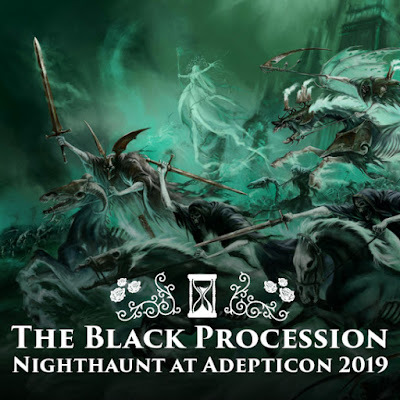 I will probably take Nighthaunt to my next event too, but I think it's time to retire the Deathriders battalion and shake up my list a bit. I want to get more of the new units done so I can field them. All of my opponents were great and a lot of fun to play against. 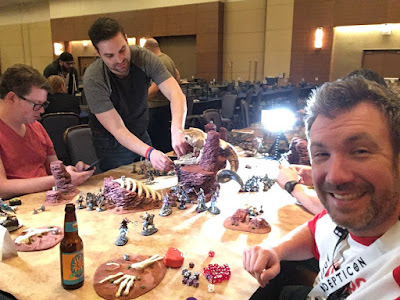 As always, Adepticon was amazing throughout and Alex did a great job of running it. 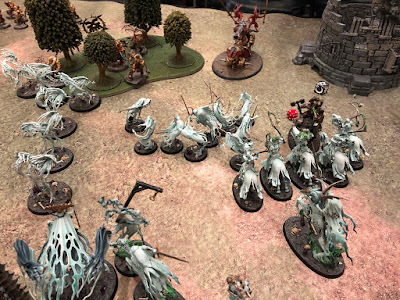 Next week I plan on recapping the final game that Eric, Mitzy, Jimbo, and myself played to wrap up the 8th Wonder of Ghur Tale of Four Warlords we were running, and maybe I'll do some coverage of my Vanguard games with my Daughters of Khaine as well if I have the time.